Jailed Kurdish militant leader Abdullah Ocalan calls on followers to lay down their arms, a crucial step in Turkey’s drive to end a 30-year insurgency. Mana Rabiee reports. Members of Bolivia’s Air Force survey flood damage and deliver aid to the most severely affected areas. Nathan Frandino reports. An independent Russian political analyst says the murder of opposition politician Boris Nemtsov shows that opposition to the authorities is treated as a criminal act. Nathan Frandino reports. German police are on the alert in the northern city of Bremen after federal authorities say there are indications of an unspecified potential danger from Islamist extremists there. Mana Rabiee reports. It is no longer business as usual at petrol stations in the Federal Capital Territory, as residents queue for as long as five hours to buy petrol. 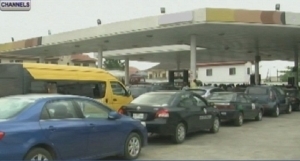 When Channels Television’s crew visited some of the fuel stations in Abuja on Saturday, long stretch of queues were seen and many residents complain bitterly about the situation. The commuters are asking the government to wade into the matter to ease their hardship. It has been like that in the past few days, some of them said, lamenting that the time wasting at the petrol stations have become the order of the day for most residents. At the Oando filling station, Herbert Macaulay Way, commuters had a long wait with no availability of the product. The supervisor at the station, Al-hassan Abubakar, explained that there had been shortage in the supply of petrol. At the Nigerian National Petroleum Corporation (NNPC) mega station, it was a quite different scenario, as all the pumps are dispensing product, only that commuters have to deal with the long queue. Although, it is not yet clear when this whole hardship currently experienced by residents of the Federal Capital Territory and other parts of the country will end, the NNPC said on Friday it added 688 million litres of petrol in the market, dousing fears raised by scarcity witnessed in some states. The corporation’s spokesman, Mr Ohi Alegbe, in a statement, said there was no need for panic buying which he said might be the reason for the recent artificial fuel scarcity. “The Corporation is working with all downstream industry stakeholders to eliminate the noticeable artificially induced fuel queues in some fuel stations,” the statement read. He assured Nigerians that the NNPC had enough products to go round for use across the country and advised against panic buying and hoarding of petroleum products. 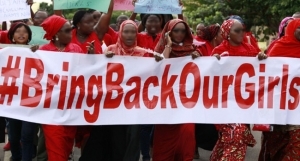 The Bring Back Our Girls Campaigners have expressed hope that the heightened counter-terrorism offensive by the military against the Boko Haram terrorist group in Nigeria’s north-east will lead to the rescue of the over 200 schoolgirls kidnapped last year in Chibok in Borno State. Speaking to Channels Television in Abuja on Saturday, the campaigners were however, concerned that “the military seemed not to have enough intelligence about where the girls are”. They observed that the Chief of Defence Staff, Air Marshall Alex Badeh had, not long after the girls were kidnapped, said that the military knew the where the girls were. The nation has witnessed several bombings and attacks from members of the Islamist sect, Boko Haram, especially in the north-east. However, the tide of the attacks appears to be abating, with the increased offensive of the Multi National Task Force. Several towns and communities have been reclaimed by the military and recently, a group of people kidnapped by the sect, regained their freedom. The members of the Bring Back Our Girls group have been holding the sit-out session for several months, demanding action for the release of the schoolgirls abducted on April 14 from their school dormitory in the Government Secondary School in Chibok. A member of the group, Ibrahim Wala is hoping that the renewed military efforts would ensure the safe recovery of the schoolgirls. They have insisted that the sit-out sessions would end when the the Chibok schoolgirls have been rescued. The leader of the Boko Haram sect, Abubakar Shekau, in a video last year, said the girls had been ‘married off’, but President Goodluck Jonathan had, during a Presidential media Chat on February 11, expressed hopes that with the heightened counter-terrorism war, ‘there are chances that the girls would be rescued’. Iraqi Prime Minister Haider al-Abadi reopens national museum and vows to prevent Islamic State militants from selling stolen artefacts. Mana Rabiee reports.